Online sales of groceries grew by 13% globally in the 12 months ending June 2018. Online sales of groceries grew by 13% globally in the 12 months ending June 2018 and now account for 6.3% of all fast-moving consumer goods (FMCG) sales worldwide, Kantar Worldpanel reveals. This compares with a 1.6% increase in total FMCG (online and offline) sales though it is the slowest e-commerce growth in five years. The biggest contributors to FMCG e-commerce growth are China Mainland and the US, which both grew at 30% – in line with the average growth rate for global online FMCG sales over the past half decade. In terms of online share of total sales, Asian economies lead the way. South Korea tops of the table with an online value market share of 19.9% followed by China Mainland (9.5%), where access to rural areas is crucial in expanding e-commerce penetration. Taiwan (8.0%), Japan (7.6%), the UK (7.2%) and France (5.6%) follow. Online pure players like Amazon, Alibaba and JD.com are attracting new shoppers while traditional retailers are seeing a decline in online customers. In Asia, pure players have made significant steps in consolidating their market growth over the past year – in South Korea alone, pure players now account for 84.5% of the online FMCG market and are attracting three out of four online grocery shoppers. Almost nine out of 10 Chinese shoppers prefer using their smartphone to make FMCG purchases online. This is in contrast to only 29% of British shoppers – almost half of consumers in the UK use a laptop, similar to French and Spanish trends. Online grocery home delivery has been adopted by almost all British and Chinese online shoppers but there is growth in France and Spain. Meanwhile, British consumers are increasingly moving to a new fulfilment model – subscriptions, which are used by 16.1% of the country’s online shoppers – representing an opportunity for the rest of Europe and in China Mainland. “Only a quarter of the world’s population currently shops for their groceries online, so it will be vital to attract new shoppers by providing a frictionless, convenient and pleasant shopping experience both online and off,” says Stéphane Roger, global shopper and retail director at Kantar Worldpanel. Download the press release with charts through the link in the right. 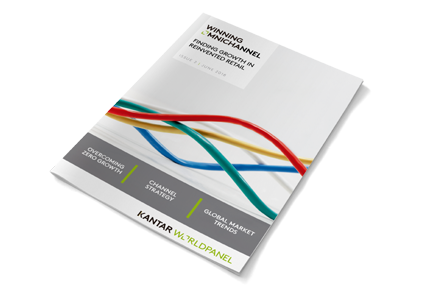 Our latest global report “Winning Omnichannel: Finding growth in reinvented retail” launches today.